At first glance it might seem like “angry” would be self-explanatory. We’ve all seen someone throw a tantrum. We’ve all gotten furious over something. There’s nothing unusual about losing one’s temper once in a while. But when Solomon advises us to stay away from an angry or furious man, he is not referring to a man who throws his popcorn when his favorite team loses the championship in the last second of the game. We’ve all done that…right? No, this proverb is talking about people who are always angry, always furious, always upset over something. It’s a warning to stay away from people like that, unless, of course, you want to start acting just like them. Women-haters. Hang around these guys very long and you’ll never find love. However, you could start a club. Disgruntled employees. Talk about angry! They make the water in the water cooler boil. Unfortunately, those who listen to them too long tend to overlook the blessing of being employed and end up out of work. Bitter wives and jilted lovers. Talk about furious! Hide all sharp objects and weapons of any kind when you’re in their presence unless you want to get hurt. Better yet, don’t listen to them for too long or you might end up being recruited to exact their revenge. Political conspiracy theorists. They mean well, but they’re not well. They see grander schemes than actually exist and draw others into their paranoia. Church gossips. They’re typically angry because things aren’t going their way. They look for ways to tear down others while they sap the joy and faith out of you. Before long you become one of them. Why be like the angry and furious man? Is not God in control? Prolonged anger signifies a heart problem fueled by selfish demands, so is it worth a snare to the soul? The next time Mr. Trouble comes around looking for a companion, politely excuse yourself; he’s not your friend. Rather, make Jesus your friend; He is gentle and lowly of heart. Instead of a snare, He will give rest to your soul (Matthew 11:29). “He that goeth about as a talebearer revealeth secrets: therefore meddle not with him that flattereth with his lips.” (KJV). “A gossip goes around revealing secrets, but those who are trustworthy can keep a confidence.” (11:13, NLT). “A troublemaker plants seeds of strife; gossip separates the best of friends.” (16:28, NLT). “A gossip tells secrets, so don’t hang around with someone who talks too much.” (20:19, NLT). To sum up, a gossip tells secrets, stirs up strife and separates friends. And how does the Bible tell us to deal with gossips? Don’t hang around with them! It should go without saying, but if someone will gossip to you, they will also gossip about you. I flourish at every level of society. My victims are helpless. I am nobody’s friend. Once I tarnish a reputation, it is never the same. I hate gossip. I have seen firsthand how it can destroy friendships, break hearts, and ruin lives. I know of someone who gossiped about their pastor, and how it caused other people to leave that church as a result of their malicious lies and slander. It caused the pastor no small amount of sleepless nights, heartache, many tears and overwhelming stress. It was so hurtful that it almost caused him to want to give up and quit the ministry! Thankfully, the pastor leaned on the Lord for strength and he is still in the ministry today. Elsewhere in Proverbs, Solomon tells us: “Fire goes out for lack of fuel, and quarrels disappear when gossip stops.” (26:20). If we want to guard against strife, we need to take a stand against gossip. Make a commitment to never speak a negative word about someone else – whether what you are saying is true or not. The power of life and death is in your tongue: speak life only! In this proverb of Solomon (10:1), he joins together two actions related to the tongue which at first blush appear to be opposites, and yet paradoxically, the two actions produce the same outcome! Let’s look more closely. In the first instance, he draws to our attention the one who “hideth hatred with lying lips.” In other words, his lips are moving, but the words pouring forth from his mouth conceal the hatred and loathing in the heart. Perhaps you’ve caught yourself exchanging Monday-morning pleasantries with a co-worker, chatting harmlessly about the activities of the recent weekend… on the outside you present the image of the nicest guy in the office, but on the inside, you hate the co-worker’s guts! You are speaking, but your speech is not consistent with your heart. In the second instance, he speaks of a different sort of person entirely – one whose mouth spews venomous slander. To return to the example of Monday morning in the office, this is the co-worker who verbally “runs down” everyone and everything, especially attacking the actions and motivations of others, casting others into a negative light. The polite person with the hateful heart, and the hateful person gushing poisonous slander – they’re entirely different, right? No, says Solomon, they are surprisingly similar. Both are morally deficient – fools, in fact. Listen up, because this is key. The “jab” of this proverb lies in the first half. It speaks to those of us who have been trained to “be polite,” when our outer friendliness is a mask of hypocrisy. Jesus reserves his harshest condemnation for people who pretend to be something on the outside, but have murder within (and yes, according to Jesus, hatred is the moral equivalent of murder – Matthew 5:21-22). It is so easy to identify – and condemn – the slanderer. As a pastor, I can say without question that slander is one of the most destructive sins that can strike a congregation. But at least with the slanderer, you know what you’ve got. 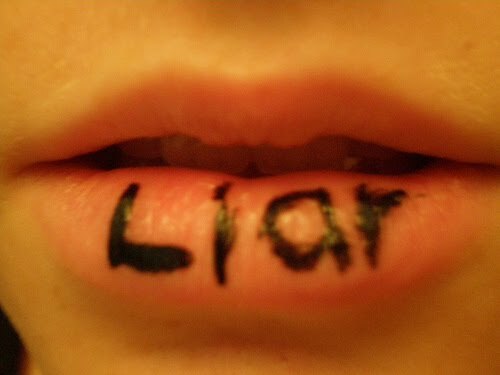 How much more deceptive, subtle, and evil is the Pharisaic hypocrisy of hiding hatred with lying lips. The proverb calls us to simplicity of speech. Say what you mean, and mean what you say. As the Master said, “Let your ‘yes’ be ‘yes,’ and your ‘no,’ ‘no’; anything beyond this comes from the evil one” (Matthew 6:37). And no, that’s not a free pass to tell people off! As Jesus-Followers, we “speak the truth in love” to one another (Ephesians 4:15). Father God, grant us simplicity of speech coming from hearts full of the love of Christ. Forgive us our sins of the tongue, we ask, for the sake of Thy dear Son, Christ our Lord, in whose Name we pray: Amen.